In small bowl, mix pretzel mixture ingredients until blended. Spoon about 1 tablespoon mixture in each cup. In large bowl, beat cupcake ingredients with electric mixer on low speed 30 seconds, then on medium speed 2 minutes, scraping bowl occasionally. Divide batter evenly among cups (two-thirds full). 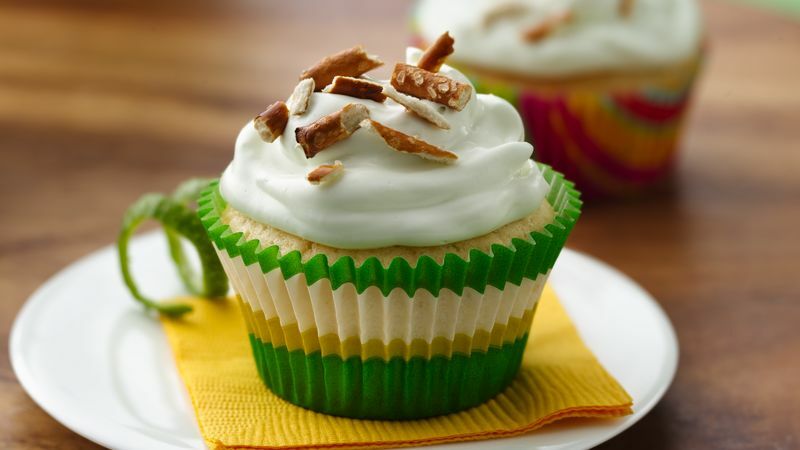 In medium bowl, fold whipped topping, yogurt and 2 teaspoons lime peel until blended; frost cupcakes. Sprinkle with coarsely crushed pretzels. Store loosely covered in refrigerator. If you have only one pan and a recipe calls for more cupcakes than your pan will make, just cover and refrigerate the rest of the batter while baking the first batch. Cool the pan about 15 minutes, then bake the rest of the batter, adding 1 to 2 minutes to the bake time.